Integration with publisher content (if you have purchased publisher access to premium content). Students have a “Preferences” action link in their view of Modules, as well. It allows them to set their default view to expanded or collapsed. You may choose one of two editors to author in the Melete Lesson Builder: Sferyx or CK Editor. The default editor in Modules is CK editor. It is the same editor that is integrated with most of the tools in the system: Announcements, Schedule, Modules, Discussions, etc. The second editor available in Modules is called Sferyx editor. It is a Java Applet (small web-based application) that is more powerful than CK. Sferyx is only available in the Modules tool. Please refer to sections in the Section module for information and benefits of each editor and to determine which one will better serve your needs. The setting is ‘global,’ meaning that when an author sets ‘Sferyx’ as the default modules editor, it will be set as the default module editor in all the sites owned by the author. Users can switch between the two browsers on the fly while editing, provided that the Java plug-in for Sferyx is downloaded and it is properly installed. Let’s say you have set Sferyx as your default editor, and while composing content, you wished you had the smilies of CK available in your toolbar. You can save your content, click on Preferences, set CK Editor as the default, and return to your authoring. Then, let’s say that half an hour later, you need to insert a math equation. You can click on Preferences and set Sferyx as the default editor and return to your authoring. If instructors do not have the required java plugin in their systems, they will NOT be able to compose in Modules with Sferyx. Setting it as the default will not work without having the Java plug-in. Additionally, instructors will have to accept the Sferyx certificate when prompted. Nothing is required for the use of CK Editor. It works in Firefox and IE. If your site has the Table of Contents module list appear in expanded view, it means that all the sections and subsections are listed on the page as hot links, as well as the module titles. If you would prefer to have only the module titles showing on the list page, you can set your default setting under the Manage >> Preferences window. Remember that no matter which setting you choose, you can always expand and collapse the lists by clicking on the little black arrows. When “Yes” is checked, then student modules will have a small print icon in the Modules list. When they click on the print icon, their modules can be easily printed or saved as a PDF (at least it’s easy to save as PDF on Macs). When printing, the entire module is printed — there is no way to limit printing to just particular sections. When “No” is checked, there simply is no print icon in the Modules list (students only), and nothing to indicate that printing is ever an option. Note: Instructors have the ability to print modules regardless of this setting. You can choose if you want modules and sections to be automatically numbered. If you choose YES, then modules & sections will show numbers. This applies to the Student View (when logged in as instructor) as well as when anyone is logged in as a student. To make this choice, you choose Yes (for ON) or No (for OFF) in Modules >> Preferences. When numbering is set to ON, each module title/section will also show the numbers. They do not show when numbering is off. 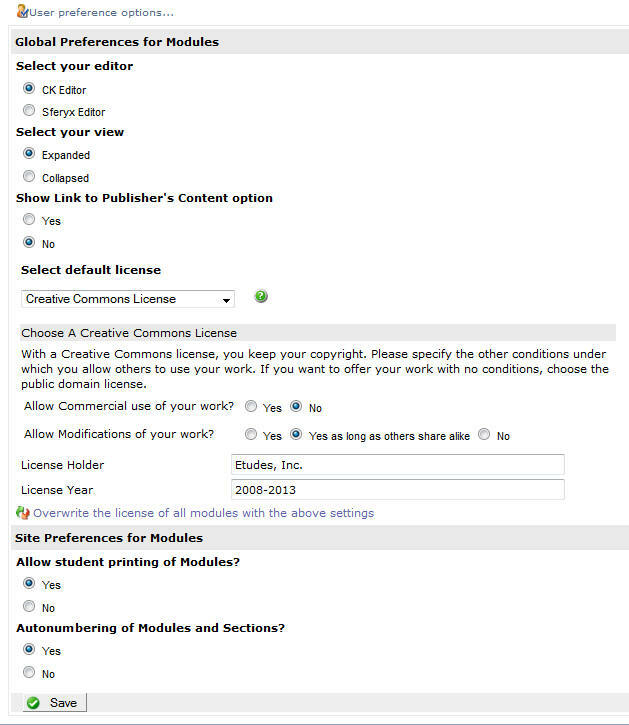 When adding new content, the default license will be pre-populated, saving you time if you have a preference as to what license to assign to your content. Please remember to change the license for material of others that you have received permission to use.